Visite vidéo de toute la propriété @ www. 90OldSchoolhouseDrive. com. Situé sur une route privée à Pittsfield, notre maison vous accueille. Au coeur des meilleurs sports d'hiver du nord-est, il est très pratique (<5 MILES) aux stations de ski de Killington et Pico. Sugarbush, Okemo, et le célèbre Mad River Glen sont tous facilement accessibles. La maison est un confortable et spacieux (2,100+ sq. Ft) trois chambres à coucher contemporaine espace ouvert salon. Ce est un endroit idéal pour se détendre et se amuser si vous êtes sur votre propre ou avec un groupe. Découvrez les commentaires de nos visiteurs satisfaits !! Avec le grand salon, la maison répond à un grand nombre de personnes encore les moyens toujours la vie privée. Les deux chambres supérieures sont particulièrement lumineuses et aérées avec des plafonds cathédrale élevés et un puits de lumière. 2 salles de bains avec une sur chaque niveau. Cette maison dispose également d'une laveuse et sécheuse et un bain à remous extérieur pour régénérer les muscles. Si la motoneige est votre intéressant sortez par la porte, sauter sur votre motoneige et monter directement sur le réseau de sentiers VAST du Vermont. Bain serviettes de bain Air-, savon, shampoing, dentifrice ne sont pas fournis. Great place to stay. Very clean. Felt at home. First of all, I really like the location of this cabin. I have been here once before a few years ago and came back since I really like the secluded location. But oh god, was the host rude this time around? The instruction that I received prior to check-in were too "straight-forward" so I was on my toes already. There are sticky notes all around the house to remind you of little things as if you're 16 year old. The tipping point of the rudeness was when I asked the host via messages if there's wifi - instead of saying there's no wifi he goes out of his way to say "there is wifi thru personal hotspot on your phone" - yes, I know there's hotspot on my phone, thank you for teaching me technology. Besides that, the hot tub didn't really work - initially I thought it was due to the cold weather but when I took a shower after that I barely got any hot water. The heater is pretty small and inefficient. There was plenty of heat in the house so luckily the cold was averted. The wood stove is nice to have if you're gonna use it but we did not use it and it was a bit dirty when we got in with some ash in it. Some of the furniture is broken, including the front door lock, so I'd be careful to not get charged for it. The furniture is old and antique which adds to the charm but the host hasn't taken good care of it. The kitchen was good, plenty of pots/pans, plates, spoons, etc. and there's a microwave, oven, stove, etc. The common area with open kitchen is perfect for a group of friends or family looking to just enjoy the cabin, but remember no showers in this cabin without hot water! Unfortunately, this review contains multiple inaccuracies. This tenant never communicated with us other than asking about WiFi, which we responded within minutes explaining how to obtain internet. We are unsure how our response was rude as we just wanted to be helpful and suggest how to access internet. High speed internet is being installed Spring 2019 but requires excavation which needs to be completed after the snow melts. We have rented this home for 8 years & have never had a heat or hot water issue. There were renters immediately before and after this group. Neither group, the current group & personally myself have had any of the problems described in this review. Our cleaning company provides detailed reports of any issues with this house and if any arise they are immediately taken care of. The hot water heater is 80 gallons so tenants do not run out of hot water unless they take extremely long showers. Our arrival & departure instructions are very detailed to assist our guests with any questions that may arise to make their stay as enjoyable as possible. There are multiple things when you own a secluded cabin with a septic system. Our instructions and notes throughout the house are merely to assist renters and to avoid costly repairs due to possible lack of knowledge with the ins and outs of a property. We have rented properties for 20+ years and have learned from years of experience that detailed instructions have led to more enjoyable stays for our guests and also keeps our home from needing unnecessary repairs. Please read all the positive reviews to understand how beautiful this property is and how helpful and curtious we are for our tenants. Great house and pleasant location. I and my family enjoyed very much our stay. The house could’ve had great potential. However: we did not receive directions on how to get into the house until we were in the state and unable to get Wi-Fi. Once we found a key we enter the house that smelled strongly of mildew as if I had not been opened for months.The upstairs was extremely hot and there was no air conditioning or way to open the windows to ventilate it. The beds were not made and the sheets were the wrong size for 2 of the beds. This made our late arrival even harder.There were no towels. The upstairs shower leak through the ceiling and dripped onto the living room carpet. The hot tub that we look forward to and paid a substantial cleaning fee for was completely empty. The exiting process was Difficult also in that you could not leave dishes in the dishwasher nor were there towels to wash dishes to put away. This was definitely not a house for us in general and certainly not a good house for an overnight stay. We strive for 100% customer satisfaction so please be sure to read the numerous 5-star reviews we have received because this review has several inaccuracies. Our HomeAway listing specifically describes in detail what accommodations our property offers. It is very detailed and this tenant must not have completely read the details which are clear and not hidden in the minuscule text. Our contact information is located all over stating to please contact me directly with any questions or concerns and it is noted in multiple reviews how available I am to assist when any problems/questions may arise. The only accurate statement in this review is the hot tub. We only have the hot tub functioning during the ski season and that was not noted in the description. The sheets are left on the end of beds so tenants know the house was cleaned. The shower only leaks when someone is careless in the shower and does not keep the shower curtain inside the shower. This tenant stayed for only one night in the dead of summer so there could have been a slight odor from the heat & humidity but by no means was our house closed up for months. We had used the house, as well as other tenants, and the smell was normal for a house that is closed up when it's very hot outside. We personally did not notice any odor nor did our previous guests we reached out to. Again, the property details clearly stated this house is not air-conditioned. The windows upstairs open easily and we do not understand how they had any issues. Most importantly these tenants never would have been able to access the property if it was not for our diligence in noticing our arrival instructions which auto send 3 days prior to arrival did not send properly. In 20 years of renting properties I have never had a group not reach out to me directly when arrival instructions are not received. Communication is key and a simple phone call, text or e-mail, which I'm always monitoring, would have clarified everything and made this a much more enjoyable stay for this group. We have added a high definition video for future guests to view that demonstrates the condition and cleanliness of our property. Every year we try to take a long weekend trip in February. This house was perfect for a long weekend skiing at Killington. Mike is very responsive. The house was easy to find, fully equipped kitchen, comfortable. Would definitely recommend. 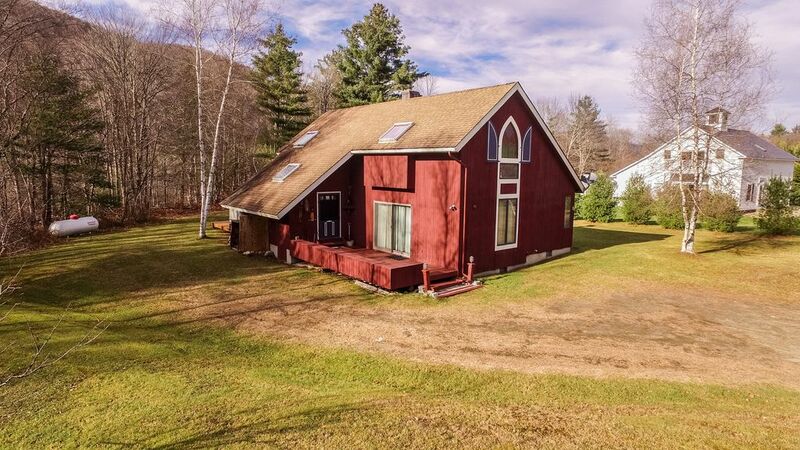 Would recommend this rental, great location with some privacy close to killington! Owner very reasonable and easy to contact! Would rent again! Ma maison est la dernière maison sur un chemin privé pittoresque juste 1/4 mile au large Rt. 100. Rt 100 est une route nationale qui répond avec la route d'accès de Killington. Ma maison est exactement 5 miles de la route d'accès, ce qui équivaut à environ 10-12 minutes en voiture des remontées mécaniques les plus proches, qui est Rams Head. Si vous préférez faire du ski le plus petit mais moins chanta mt Pico. alors vous conduire environ 1 mile plus à la base du Pico Mt ..
Quelle que soit la montagne, vous choisissez le lecteur est court et sur les routes bien labouré !! Any mid-week stay from Sunday afternoon until Friday morning is only $899 for the week!! Arrival Instructions will be e-mailed a week prior to arrival.